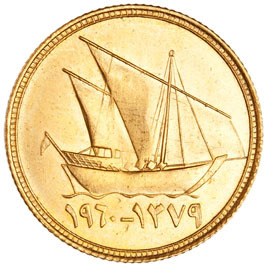 This gold coin is supposedly a pattern, of which reportedly 1,000 pieces were struck and distributed as presentation pieces. 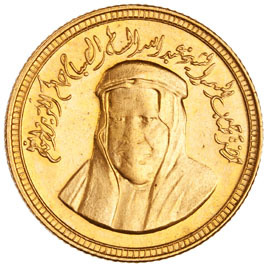 Dated 1960 (corresponding to 1379 Hijra), and featuring the likeness of Abdullah III Al-Salim Al-Sabah. Very little else is known about it besides the fact that it weighs 7.790 grams. I would be very interested in learning more if anyone has additional information. This entry was posted in General and tagged Gold, Kuwait, Pattern. Very nice and very informative site, dear Mahdi. I am sure that this will be an important addition to our knowledge of coins and banknotes of the Arab World. Thank you dear Avo for your support and I hope you enjoy this blog.